In this blog I always mention FIBER as being a big “bonus” in a food. I am sure that you have heard that fiber is good for you, but do you know why? 1. Fiber makes you feel full! It takes longer for your body to digest high-fiber foods, thereby increasing satiety, possibly leading to weight loss. 2. High fiber grains have not been “stripped” of nutrients as many processed grains have been. Therefore, they may be more healthful! 3. It can help to regulate your GI system. Less constipation, less bloating, more regular bowel movements. 4. Foods that are high in fiber are also high in vitamins and minerals (ie: fruits and vegetables). 5. It may help to lower cholesterol levels, thereby lowering your risk for coronary artery disease. Now, there are two kinds of fiber, soluble and insoluble, and both have healthful benefits! Soluble (dissolves in water) helps prevent cholesterol from being absorbed by the intestines. Soluble fiber may also to help minimize the rise in blood sugar levels after a meal. This type of fiber can be found in beans (they have both types of fiber), oatmeal and oat bran, fruits such as apples, mangoes, plums, kiwi, pears, blackberries, strawberries, raspberries, peaches, citrus fruits, dried apricots, prunes, and figs, and some vegetables such as dried peas, beans, and lentils. 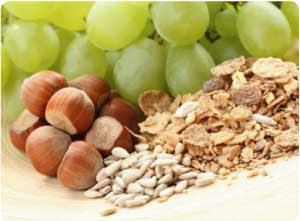 Insoluble fiber helps regulate bowel function and may help prevent colon cancer. This kind of fiber also makes us feel full and is found in whole grains and wheat bran, brown rice, seeds, and vegetables such as carrots, cucumbers, zucchini, celery, and tomatoes. So how much of each kind? Guess what? It doesn’t matter! Just aim for 20-35 grams per day (that’s almost twice of what the average American eats).